Shirts With Random Triangles: A "Kick Bama Kick" t-shirt? Of course there is. 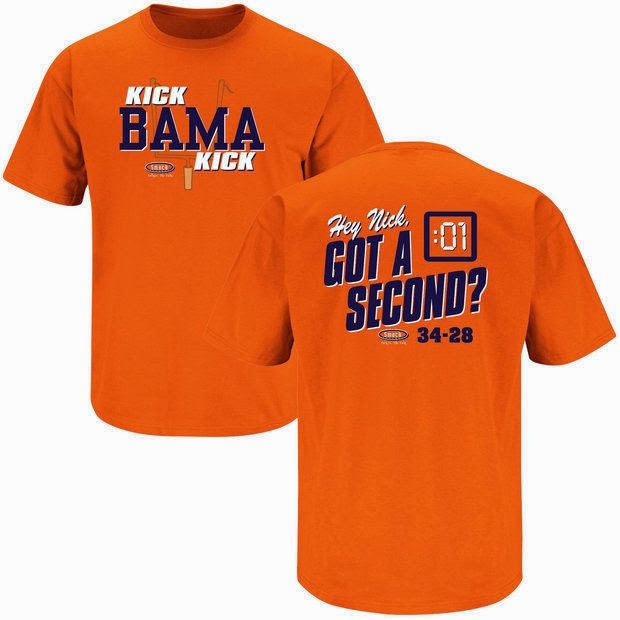 "Kick Bama Kick" has apparently become the popular name to describe the shock-the-world final second of last Saturday's Iron Bowl. If you're planning to cash in on that phrase, though, you're too late. Smack Apparel, purveyor of some of college football's best unofficial and unlicensed t-shirts, already has out a "Kick Bama Kick" t-shirt out. It can be yours for $17.99, and is the perfect gift to put under the tree for that Auburn fan of yours. That is if one of the 'Bama fans in your life hasn't poisoned it yet, of course.